© Alan Bowness, Hepworth Estate. Photograph by R. H. Hensleigh. Along with her friend Henry Moore, Hepworth attended the Leeds School of Art before moving to the Royal College of Art, where she graduated in 1924. Though she lost the prestigious Rome Scholarship to John Skeaping, she married him and traveled to Italy, where she studied Romanesque and early Renaissance sculpture and architecture. Hepworth’s other interests included Egyptian, Cycladic and Archaic Greek sculpture, which are reflected in her carvings of the late 1920s. In 1932, after divorcing Skeaping, Hepworth married Ben Nicholson, with whom her work shared an affinity and who is today acknowledged as one of the leading artists of the twentieth century. Early in their life together, the two visited and became close to Picasso, Braque, Brancusi, Arp and especially Mondrian, all of whom shared an interest in formal purity. In 1933, Hepworth and Nicholson joined Abstraction­ Creation and were founders of Unit One, a group of architects, painters and sculptors committed to Constructivism or Surrealism. Throughout the 1930s and 1940s, Hepworth eschewed the figure and refined the principles of geometric abstraction in hundreds of exquisitely carved sculptures. Her modestly scaled works were thoughtful expositions on the balance of light and mass. Equilibrium was paramount for Hepworth, whether carving a contoured horizontal or a vertical form. In the late 1940s and 1950s, Hepworth’s work began to increasingly reference the figural as it became more monumental and upright. Hepworth viewed this development as the product of her increasing interest in the relationship of the human form to architectural spaces; at the same time, she began to receive a number of large, outdoor public commissions. Perhaps as a result, in 1956 Hepworth began to work in metal, a choice some viewed as a negation of her previous truth to materials, while others viewed it as a sign of increased confidence and desire to create on a larger scale. Though it measures less than thirteen inches in height, Square Forms is evidence of this. 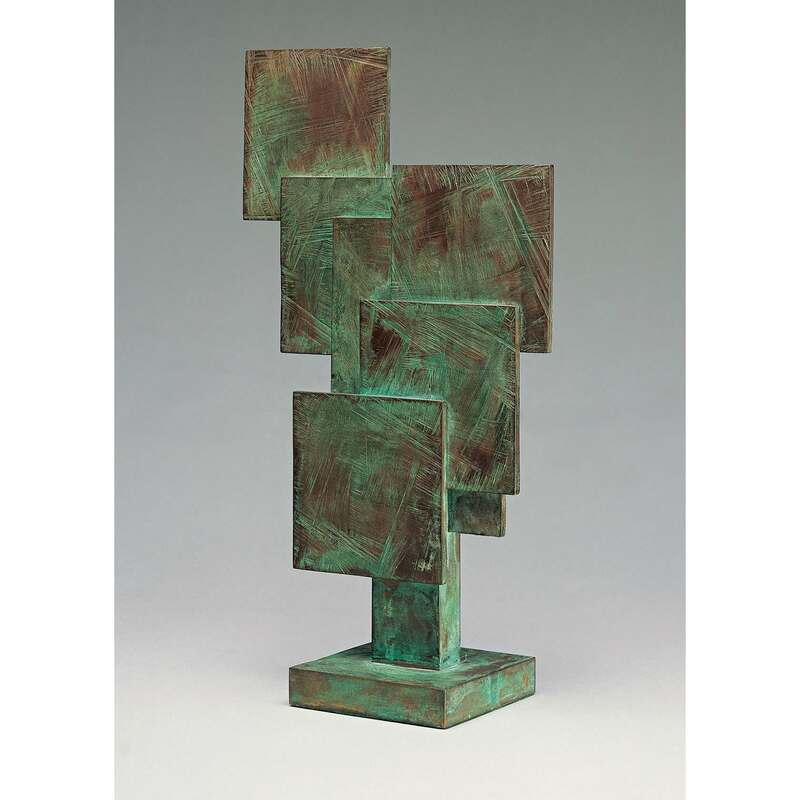 Square Forms likely originated as a model for a larger sculpture, Square Forms with Circles, 1963, to which it is nearly identical. The 1963 work is eight times larger, however, and its uppermost square has a circular depression cut into one side and a circle incised on the other.The works are unusual for other reasons. The intertwined geometric and planar surfaces clearly recall the paintings and reliefs of Ben Nicholson, while Hepworth’s own works of this period were generally more organic. Also significant is the manner in which the smaller sculptures were produced (this is one of an edition of nine). Bronze sculpture of a similar scale is usually cast whole. Square Forms, however, is an assembled work. Comprising seven elements projecting from a rectangular column screwed to a square base, the core of the cluster is held by a vertical rectangle secured in the column by a mortise joint. Other squares are stacked up and displaced upward or to the side by being set into cuts made into the other slabs. In addition, this is one of the few multiple editions of a single work Hepworth issued, and each one is individually constructed. Unique in many respects despite its serial nature, Square Forms marked a point of departure in Hepworth’s singular career.